APRHF exhibition of Amtrak history - Amerian Passenger Rail Heritage Foundation exhibition of Amtrak history. In the heart of APRHF Silver Rails Country! In 2007, Shivaji Surve, a Co-Owner and Chief Information Officer of TrainWeb LLC and a Member of the Board of Directors of APRHF purchased two ex-Amtrak Mail Handling Cars (MHC). These two MHC railcars were donated by TrainWeb LLC to the APRHF. They were moved off the BNSF mainline by crane and truck and placed onto rails on Silver Rails Properties LLC near the main entrance and lobby of the Depot Inn & Suites at the Route "D" exit off state highway MO-63 in La Plata, Missouri. The enitre collection of Amtrak history memorabilia from TrainWeb.com and the Amtrak Historical Society have been placed on display inside these two ex-Amtrak MHC's. The memorabilia from the Amtrak Historical Society includes items dating all the way back to the formation of Amtrak in 1971 and even before. The memorabilia from TrainWeb.com include a vast array of items since the formation of TrainWeb in 1995 all the way up to the present day, plus many items from earlier dates that have been donated and sent to the APRHF. Everyone is welcome to view the collection of Amtrak heritage memorabilia inside these two ex-Amtrak MHC railcars free of charge. Please inquire at the main desk at the Depot Inn & Suites to obtain admission to the railcars. Photos and report by Geno Dailey. 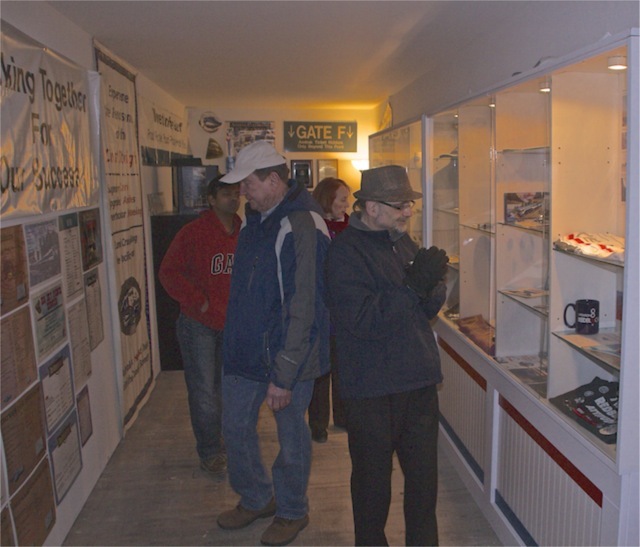 More photos of items on display in the railcars. 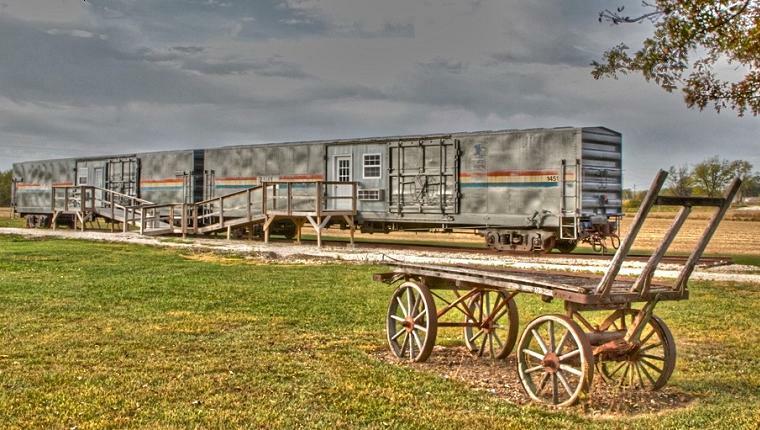 How these railcars ended up in La Plata, Missouri. Grand Opening Story & Photos by Carl Morrison. Grand Opening Story & Photos by Chris Guenzler. More Photos of the railcar exhibits by Chris Guenzler. APRHF exhibition of Amtrak history website. APRHF Amtrak history work page. Grand Opening of the APRHF exihibiton of Amtrak history on February 23, 2008. The APRHF is continuing to explore the creation of a larger museum facility devoted to the history of passenger rail in addition to the APRHF exhibition of Amtrak history. There is a switch and siding off the BNSF mainline near the Amtrak Station in La Plata. The APRHF founders have acquired over 40 acres of land in line with this railroad siding that could be used as the location of the new museum and railyard. These plans are currently in the conceptual stage and more information will be posted here at a later date. If you would like to donate Amtrak memorabilia to the exhibition or contribute funds to help with the operation of the museum, please send them to: APRHF, P.O. Box 175, La Plata, MO 63549. Checks should be made out to the APRHF (or American Passenger Rail Heritage Foundation). You can also click here to donate online. APRHF is a 501(c)(3) organization so your contributions are tax deductible to the extent allowed by lax. Please consult your tax advisor for details. The APRHF is specifically seeking Amtrak memorabilia from the 1970's plus rare and significant Amtrak items from any other year. If you own such items and would like to share these items for the enjoyment and education of the public, please contact us. We'd prefer that items be donated to APRHF rather than loaned to us. 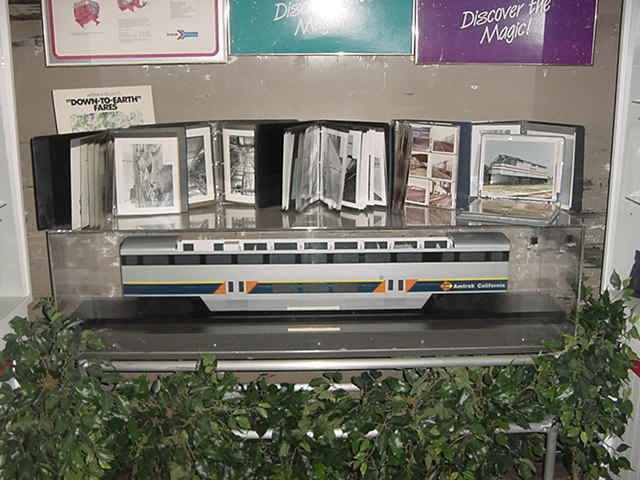 However, if you have items of Amtrak history that are particulary rare or valuable that you'd prefer to just be placed on public display rather than donating them, APRHF will consider accepting such items for public display. We ALWAYS welcome financial donations. Follow up: In 2012 the APRHF did a major refurbishing of the railcars. The roof of the railcars had been rusting and we found that the walls of the railcars did not provide adequate insulation to keep the heat in winter or the air conditioning in summer. The roof was repaired and rust sealant applied to all exterior surfaces of the railcars. The interior of the railcars were insulated to better hold in the heat in winter and hold the air conditioning in summer. Unfortunately the sealing and painting of the railcars damaged the original Amtrak stripe decals and the decals from the U.S. Postal Service. The APRHF is currently seeking donation of replacement Amtrak stripes and U.S. 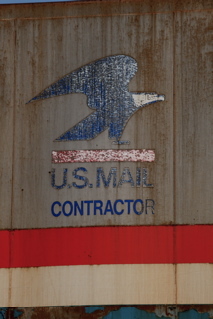 Postal Service logos. If you know of a source for such decals that would be willing to donate these to the APRHF, please contact us. Please Click Here to become a member of the APRHF and help maintain and expand the APRHF exhibition of Amtrak history!